I'm one of those unfortunate people who have a birthday in January. For years I've cursed this as everyone is still hungover from Christmas, and frankly don't want to be concerned with such frivolity. Being a photographer has slowly changed my opinion of January, and winter as a whole. Instead of seeing endless days of cold weather, I see limitless opportunities for frosty landscapes and those cool, blue tones as the sun hangs forever low in the sky. I've always been in love with the spring and autumn, but it's taken a while to fall for winter. My dear wife-to-be Rachel treated me to a weekend in the Peak District at the end of January, nestled in the heart of the white peaks, down near my childhood haunts of Dovedale. When we left, there was little snow in Birmingham, but as we drove closer, the snow appeared. The night before we arrived, 6 inches had fallen and lay like a fresh blanket over the landscape, with snow still falling, rushing towards the windscreen in the dark, looking like we'd entered warp speed along the winding country roads. Traveling is not only about the images, but the experience. As our Skoda struggled up the icy roads on the way to our B&B, we quickly realised that attempting to navigate such a road late into a freezing night would be impossible. Soon, with canceled reservations, we precariously slid along the local pub, only to be met with an open fire, great company and whisky late into the night. Frozen Landscapes in the Peak District. Taking it all in on Curbar Edge. Snow has a way of making everything new. Places I was already familiar with changed completely, everything was different. On the Saturday, after missing the sunrise due to too much good cheer the night before, we set off on a walk towards Thor's Cave, crunching our boots into the frozen snow, making satisfying and savoured sounds. The route was muddy, and typically we took an unexpected detour, closely watched by flocks of sheep, and muttering a occasional hello to fellow walkers. I was trying out my Lee Circular Polariser for the first time. I've been planning on buying one for a while, and really I'm not sure why I left it so long, as it gives far more power over an image in the initial capture stage, rather than relying on post, which is something I'm trying to change. Curbar Edge in the Snow at Sunset. In the evening, we took a trip out to Curbar Edge, not a place I've been before. One of the downfalls of snow, is that it obscures the easiest way up to the top of hills. We walked back and forth in snow that went up to my thigh (not that hard as I'm absurdly short), freezing my walking trousers and ensuring I felt eternally grateful for my waterproof and sturdy Brasher boots. Eventually we rejoined the route and wandered along the edge, witnessing the light changing as the sun descended. As is sometimes the case on clear afternoons, the light on the opposite side to the sunset was more interesting. The warm tones contrasting with the cool blues and white of the snow. Hints of the hidden heathland peeped through the white stuff, appearing like tangled balls of yarn. There was a sense of fun that only snow can bring. These two snowmen were there when we arrived, holding hands triumphantly. By the time we returned, someone had build a snowdog, making the snow-family complete. Day two was slow to begin. On the Saturday night we made friends with the local pub owner and his pals, and ended up participating in a lock-in till 3:30am. It was an unforgettable night, but of course, a sunrise was off the cards. I don't really mind this, I prefer to let life unfold and plans to change and reform however life demands. Trading a sunrise for forging friendships and connections feels like a worthy trade indeed. After checking out, we headed up to the Hope Valley. The snow was still around, and I wanted to see how Mam Tor looked in such weather. However, we needed to take a detour to Sheffield, and of course Google Maps took us the most logical route. Snow, ice and logic are not compatible. As we pulled round and passed Stanage Edge, I did not recognise it even though I've been there several times. The snow transformed the landscape, and conditions were awful. The road wound up and it soon became apparent that cars were unable to pass, especially not our little Skoda. We reserved down and descended into a crosswind that whipped up the powdered snow, throwing it across the road, creating drifts and reducing visibility. I stood in it's path, feeling the force of nature, and a group of walkers wandered passed. As they entered the heart of the blizzard, one the team who was lagging, huddled in against the wind and broke into a run towards his pals. This is probably my favourite image of the whole weekend. White Out at Stanage Edge. To end the day before heading home, we took a trip out to Bamford Edge. Unfortunately I had underestimated how icy the road would be, and as we approached the top, we passed a couple stuck on the ice and mud. After a lot of pushing we managed to get them back on the road, but consequently had to reserve back down the hill, much to the annoyance of several 4x4 drivers who had no issue coming up. I grabbed the shot below quickly before our embarrassing descent! We ended up back at Stanage Edge to watch another clean and bright sunset and moonrise, witnessing the light change from cool blue to warm yellow. The Peak District is fast becoming one of my favourite places in the UK. It's close to home, full of diversity and always seem to provide great photo opportunities. Hoping to return in the spring and summer and explore the landscape in full bloom. Until then, I'm glad I got to experience it in the snow, wearing it's winter jacket, showing the full ferocity of nature's beauty and wrath. 2014 has been a seminal year for me as a photographer, both professionally and personally. I can see the progression from the beginning to the end and I've had the help and support of some wonderful people in the industry. I wanted to share my top ten images of 2014, as well as give some thanks and praise to the people who have been there along the way. "Relentless Optimism" - Bear Pits in Bristol, England. Fujifilm X-Pro1 + 18mm f/2 @ f/4. 1/50. I've always been a photographer and a person who struggles to pick one discipline. At school I won prizes in arts and science, played sports and tried my hand at everything (except musical theatre, never musical theatre). Ostensibly, I'm a landscape photographer, but I love exploring all the different genres of photography, so this top 10 will be a mixed bag of images and disciplines. Basically, if I find it interesting, I'll shoot it. This shot was taken in the Bear Pits in Bristol on my birthday. I'm very fond of Bristol, especially it's culture, and I instantly fell in love with this piece of graffiti. As the old lady with her shopping bag turned the corner, I pushed down the shutter. 'Relentless Optimism' is one of my mantras, even though it can be sometimes hard to maintain. "Sunrise over Selfridges" - Birmingham, England. Canon 6D + 16-35 f/2.8L II @ f/22. 1/25. Couldn't really not include an image of Birmingham. I've done my own top list for Brum, but this one I held back for this blog. I get excited about foggy mornings, and this one was a favourite. The fog cleared quickly, making for a beautiful sunrise, and my favourite aspect of the 16-35mm, the sunstar, pretty much made the image for me. "Turquoise Light" - Clevedon, England. Fujifilm X-Pro1 + 18mm f/2 @ f/11. 1/200. I've spent a lot of time down in Clevedon and Somerset in general. I've always found a decent sunset impossible to capture, mostly because the conditions have never been favourable. However, on this particular day, it wasn't the sunset that was the major event, it was the transient light several hours before. The colours in the sky complimented the colours on the pier, turquoise, with streams of light penetrating through the cloud. Probably one of my favourite images of the year. "Light at the End of the Tunnel" - Monsal Trail, England. Fujifilm X-Pro1 + 18mm f/2 @ f/2. 1/50. The Peak District is a favourite place of mine, and two of my favourite people live near it. I love visiting them just because being near such good energy is inspiring. 2014 has taught me again and again that people matter, much more than praise or success. We went on a winter walk through the tunnels of the Monsal Trail which afforded the opportunity for some dynamic monochrome silhouettes. Looking back I hadn't realised how much I appreciated the Fujifilm 18mm f/2 lens. It's fast and it works really well in situations such as this. "In Rolls the Weather" - Crummock Water, Lake District, England. Canon 6D + 70-200mm f/4 @ f/11. 1/400. I visited the Lakes several times over the year (and intend to return for my birthday weekend in January). During the first trip, we stayed in Buttermere so I had easy access to both Buttermere and Crummock in the early morning. Neither sunrise was particularly note-worthy, but the light that came afterwards made up for the disappointment. The cloud rolled over the fells above Crummock Water, and the diffused light illuminated the slopes. I'm a big fan of telephoto lenses for landscapes. Wides have their place, but looking closer has it's benefits. Probably my favourite photo of the entire year. One of those moments where the three photos before and the three photos after fail to have the same impact (it's all about the timing). The cat arching into the sunlight at that moment made it work. It's a quintessential continental image, the kind I want to put on my living room wall, and reminds me of a happy afternoon on a warm summer's day. Another example of France being a haven for interesting scenes. I went back for this shot after wondering if I should or not. That's something I really struggle with; street photography in general, but I find people wonderfully interesting. 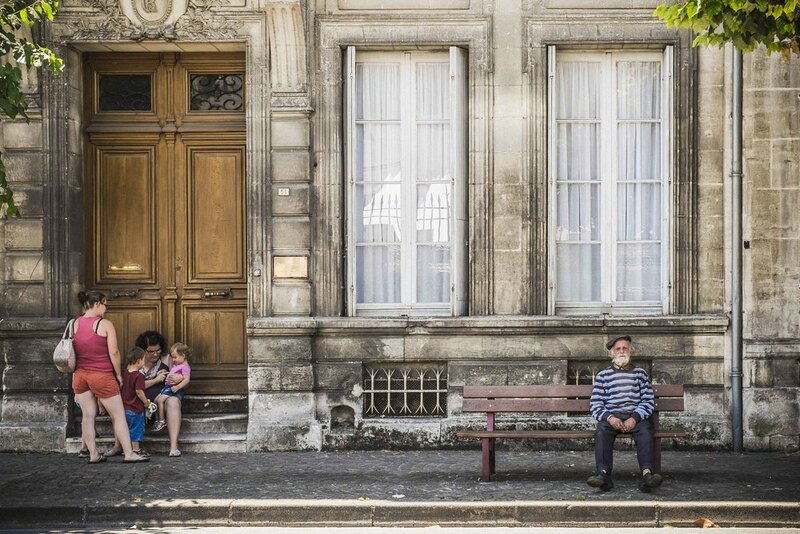 I initially noticed the old man sat on the bench, looking thoroughly French, and when I returned, his quiet solitude was amplified by the family to the left. Generations, close together put completely alone. Taken at the end of a wet weekend in the Lakes with good friends. On the final morning, my buddy Rich and I returned to Blea Tarn for the sunrise, finally the light prevailed. We drove on to the Langdale valley, chasing the weather and the light that appeared on the winding road that descends down the scene was worth all the rain. My favourite part of this image is the hint of a rainbow on the left hand side, it's virtually imperceptible, but like the best things, if you look hard enough... When the rainbow took form, I literally jumped up and down with excitement. These are the moments, amazing to witness, whether I capture it or not, that define me. Fujifilm X-T1 + 10-24mm f/4 OIS @ f/10. 20 Seconds. September is a lovely time to visit the moors, and I spent time of both Exmoor and Dartmoor. The late summer sun remained throughout the week, a treat after the dampness of the Lakes. On Exmoor, the heather was just about to go over and presented some final opportunities to capture it's colourful beauty at sunrise. Looking torwards Porlock, this was a 20 second exposure on a morning filled with transient light. Of course, the universe remained in balance as I left my shutter release cable on the moor, forever lost. Fujifilm X-T1 + 10-24mm f/4 OIS @ f/22. 1/3. November, mid semester, the most bonkers for someone teaching in higher education like me. We took a weekend out to explore the Peak District, drink whisky, take photos and be with our soon-to-be traveling friend. On Stanage Edge, the wind was howling, but the climbers were undeterred. As the sun went down the cloud broke and my timing was on to grab the briefest of sunstars, peaking through the weather, illuminating the rugged autumn foliage. "The Watchers" - Dartmoor, Devon, England. Canon 5D MK III + 24-70mm f/2.8 @ f/22. 1/80. There is something magical about the ponies that roam Dartmoor and Exmoor, especially in the golden light. The fog had lifted off the landscape of Dartmoor and the sun was creating to most glorious of atmospheres as the road winded through, back towards Yelverton and an impending breakfast. I spotted these two grazing on the roadside. When I arrived they calmly paid me the smallest moment of attention, surrounded by sheep and gorse. Several frames after they would gallop off into the morning light. I'm saving most of those images, although I'm not sure why. Some moments feel more sacred than others. It was the St. Patrick's Day Parade in Digbeth, and I was capturing the atmosphere. This gentleman's face caught my eye and then his hat grabbed my attention. All I can see is all the stories he must have to tell, one for each badge, each line on his face. The crowds closed around me and he disappeared into the festivities. I've been told he is a Digbeth local, maybe I'll see him again when the parade rolls through. Fujifilm X-T1 + 18-135mm f/3.5 - 5.6 @ f/11. 1/60. One of my latest. There's nothing more satisfying than clean, crisp, frosty mornings and still, reflective water. Pontsticill Reservoir and the surrounding Brecon Beacons has been my playground for the last 4 days, and each morning exploration has brought immense happiness. That's the thing about all of these images, the process, the moment, the editing, the sharing - all of it contributes to my wellbeing. Photography keeps me grounded, it keeps me focussed, and it keeps me learning. It is a curve, a beautiful, endless, unfinished curve. Sometimes you shoot an image and you know that the value it has is intrinsically personal. It's unlikely to be popular, but it signifies something. This image of entangled branches covered in hoar frost in the heart of the Brecon Beacons symbolises a shift, just not one that I'm able to verbalise at the moment. It's abstract, conceptual and reminds me of the interconnected nature of art and life. I'm proud of it, and I'm not even sure why... But it makes me excited to see what 2015 brings. I want to shout out to the amazing community that have supported me through the year, and also some of my contemporaries who inspire me. Johnny Patience and Rebecca Patience - Both intensely talented photographers working predominantly on film. I've had the pleasure of spending time with them on both of the LNDNWLKs and feel grateful to call them friends. Good energy is infectious. They are people who vivaciously encourage the community around them, building confidence, and sharing all they can, whenever possible. One of biggest inspirations from this year, and I'm incredibly grateful for all that the do and say. Mathieu & Heather, AKA Mirrorlessons - The Mirrorless community has some brilliant bloggers at it's spearhead and one of the finest is Mirrorlessons. It's a resource not only for the technical aspects of using a mirrorless camera, but also for aspiring photographers. The community that has grown up around the site is a great place to get feedback and generally be part of something. I'm honoured to have been interviewed for their website, and their collective belief in me and my work has been a high point of the year. Olivier Glod - What a guy! One of the loveliest people I've met in the last year. Genuine, talented, warms your heart to chat with him. Marco Larousse - Inspirational street photographer, all round lovely guy too. This image in particular sticks in my mind. Perfection. Ben Cherry - Wonderfully encouraging and supportive. Also has a fondness for the Peak District and his work from Borneo is superb. Robert Paul Jansen - Stunning in whatever format, whether it be iPhoneography, film or digital. Donovon Bond - Creator of Fuji vs. Fuji and Co-Founder of FujiTuesday. An inspirational member of the Fujifilm community. Hopefully I can buy him a pint when he makes it back over to the UK! Othman Kammah - The other Co-Founder of FujiTuesday, and another supportive member of the Fujifilm Community. I'm a particular fan of his 1 camera, 1 lens project. Rafa Garcia - A genuinely wonderful photographer with whom every interaction is a joy. Then there's those who are inspiring me to shoot film and helping me find the best way of going about such an endeavour, especially the lovely and talented Andy Spencer. My dear friend Rich Jones, currently traveling the world with his camera. Also big love to Stacy Guiney, an old friend who took a big step to strike out on his own as a freelance photographer. Check out his shoot at the Morgan Motor Car factory. Recent acquaintance Ugo Cei. Currently in love with his project on lighthouses. Amazing stuff. A year ago I was without a strong photographic community, and a year on I feel very much part of a beating, vibrant, supportive family. If I've missed anyone out, I do apologise, I've been writing this blog for about 3 days and I've sort of lost the will to live at this point. Thanks for all the inspiration, guys (and a few gals). Can't wait to see what you produce in 2015! If there's anything I can do to help, I'm ready and willing.